Instead of sticking your money in a savings account, here's a better idea. There are several good reasons you may want to keep some cash on the sidelines. If you're retired, for example, and your priority is capital preservation, it can be a smart idea to keep some of your assets in cash. The problem with keeping cash on the sidelines is that savings account interest rates are extremely low right now, and in order to get a decent interest rate on your cash, you need to commit to a CD that you can't touch for several years without paying a penalty. Fortunately, there is a solution, called a CD ladder. This can help you get the best of both worlds -- easier access to your savings, and the higher interest rates that come with long-maturity CDs. The obvious problem with cash investments, such as savings accounts and CDs, is that they don't produce much in the way of returns. 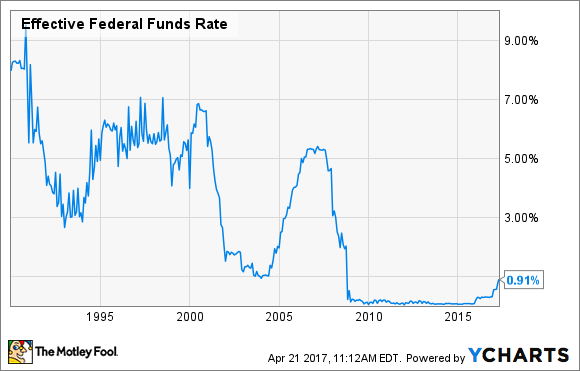 This is especially true now -- even after a few rate hikes by the Federal Reserve, interest rates are extremely low in a historical context. Despite the drawbacks, there are still some valid reasons for wanting to keep some of your investments in cash. Maybe you think stocks and bonds are too expensive after the nine-year bull market, and want to have some cash on the sidelines. Or, maybe you're retired or close to it, and capital preservation is your biggest priority. In this case, it can make good financial sense to keep a portion of your portfolio in cash. Source: FDIC. Rates are current as of April 17, 2017. There are two main problems with this strategy. First, you may need you money sooner, which means you'll probably pay a penalty if you withdraw from your CDs before maturity. Also, if interest rates rise in the next few years, as they're widely expected to do, you'll be stuck with a low interest rate. A solution is to construct a CD ladder, which basically means staggering your CDs maturity dates. As an example, let's say that you have $10,000 that you'd like to keep in cash equivalent investments. You can divide this money into five groups of $2,000. You would invest $2,000 in CDs that mature in one year, $2,000 in CDs that mature in two years, and so on. Once the one-year CDs mature, you would invest that money in five-year CDs at the then-current interest rate. The idea is that some of your CDs will mature every year, but you'll also be receiving higher long-maturity interest rates on some of your money. This way, you'll have access to some of your cash if you need it, and you'll be able to take advantage of interest rates as they rise. For example, if five-year CD interest rates spike to say, 4%, over the next year, you'll have $2,000 from your one-year CD maturing, with which you can capitalize on the new, higher interest rate. Here's a link to the Federal Deposit Insurance Corporation (FDIC) page with the weekly average CD rates, so you can compare the difference between long-maturity and shorter-maturity CDs. The bottom line is that a CD latter is a smart strategy for investors who want to keep some cash on the sidelines, without tying up their money for a long period of time or settling for low short-term interest rates.